Brusceto is one of ten 5-star luxury villas available to rent on a private estate of Castello di Reschio. This private estate covers 2,000 acres of Umbrian countryside with expansive views of rolling hills, olive groves and vineyards and forests of ancient oak and chestnut trees. Little has changed since St. Francis of Assisi preached here in the Middle Ages. 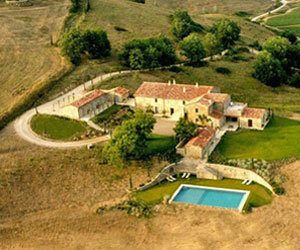 Brusceto is a restored 17th century farmhouse, fully converted in 2002, set in its own private grounds. Reached by a gravel road it offers privacy and incredible views. It has been meticulously restored with state-of-the-art bathrooms and kitchen. The immaculate gardens include a heated 14m infinity pool. Enter into the large open dining room with a fireplace where to the left will be an open lounge area and living room, also with a fireplace. To the right of the dining room is the study with a fireplace. Past the study is the fully equipped kitchen which has access to a covered outdoor dinning area that leads to a summer room that has French windows and direct access to the garden. Across the dining room from the study is a double bedroom with en suite bathroom and direct access to the garden to round out the floor. Up on flight of stairs is a living room with an external staircase to the garden. Forward from the living room is a hallway that leads to a double bedroom with individual bathroom with shower and a large double bedroom with en suite bathroom with shower. To the right of the living room is a large twin bedroom with en suite bathroom. Finally, behind the living room and staircase is a hallway that leads to the master suite which contains a large double bedroom with en suite bathroom and a private terrace. Inside is a shower, a bathroom, and changing facilities. • Access to the property is via an unpaved road which is in fairly good condition.